Our refurbished Zebra ZM400 includes additional productivity-enhancing features and modern, flexible network connectivity for easy system integration in most manufacturing, warehousing and business applications. The refurbished Zebra ZM400 is an industrial/commercial workhorse also delivers efficient 4-inch-wide labeling thanks to its quick throughput and 10 inches-per-second print speed. Contact us today about buying, servicing, renting or selling Zebra ZM400 gear! 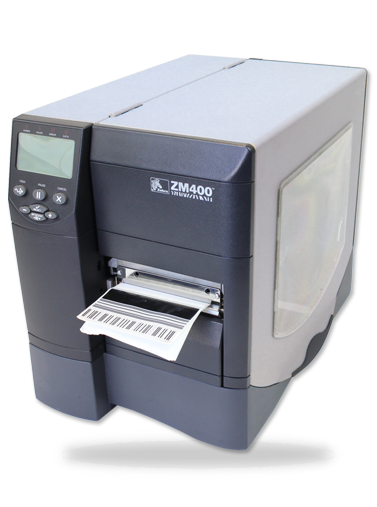 Built RFID Ready and offering a multitude of options including 600 dpi (24 dots/mm) resolution, the refurbished Zebra ZM400 is upgradeable to grow with changing needs. Plus, design enhancements make this new-generation Z Series printer even easier to operate, load, and maintain. Of course, this printer and all others are backed with Sterling Mobile’s 90 Day Warranty Contact us today about buying, servicing, renting or selling Zebra ZM400 gear!